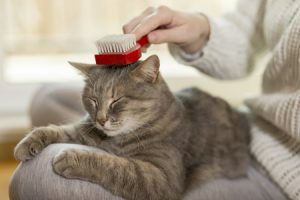 Cats may spend a lot of their free time grooming themselves, but that doesn’t mean they don’t appreciate a little assistance from their human companions now and then. In fact, running a brush through your cat’s fur offers a great opportunity to bond with your cat and prevent potential health issues. You can learn more about the benefits of grooming your cat below! Tired of finding hairballs scattered around the house? Regular brushing can reduce the amount of loose hair your cat swallows while self grooming. Your cat will feel better, and you won’t have to worry about cleaning up hairballs nearly as often. While you’re grooming your cat, keep an eye out for parasites like fleas and tick as well. If you notice small black specs on the comb, for example, your cat may have a case of fleas. These tiny parasites can be easy to miss, but a grooming session is a great time to take a closer look at your cat’s skin and fur. Grooming also helps to remove matted fur and distribute the natural oils that promote healthy skin and fur. Start brushing your cat once or twice a week, and you may start to see a noticeable improvement in the appearance of their fur. Be sure to make grooming an enjoyable experience for your cat. Be gentle when combing out matted fur and reward your cat with praise and treats when you’re done. A little grooming can go a long way; don’t force your cat to continue if they decide to get up and walk away. Before long, these grooming sessions may become some of your cat’s favorite activities. ← Why do House Cats Have Slit Pupils?